Those wishing to celebrate a quinceanera need to be registered members of the parish actively participating in the life of the community. They should be participating in formation in religious education either through the Catholic schools or the PSR program. They must also attend the quinceanera preparation and retreat prior to the date of the celebration. The community of Our Lady of Guadalupe rejoices with those who celebrate the birth of a child. Those wishing to baptize their child must be registered in the parish or have a letter from their pastor granting permission for baptism. 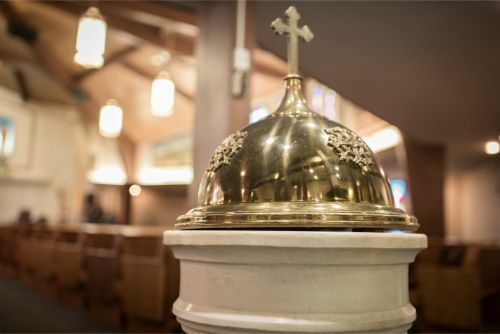 Parents and godparents are expected to attend a baptismal preparation class prior to their child"s baptism. Classes are held once a month in both English and Spanish. After attending the class, contact the rectory to schedule the baptism. Godparents must be at least 16 yrs old, have received first communion and confirmation and actively living their faith as well. If not members of Our Lady of Guadalupe parish, they should also present a letter from their pastor. The sacrament of confirmation is celebrated once a year with all three parishes joined together in a common celebration at Holy Cross Church. Preparation classes are held in the spring semester for those generally in their sophomore year of high school. Participants should be registered in a parish and practicing their faith as an active member of the parish community. Students should also have been engaged in formation in religious education, either through the Catholic school system or the PSR program. Sponsors for confirmation should be at least 16 yrs old have been confirmed and actively living their Catholic Faith. Preparation classes are held as part of the normal Catholic school curriculum and of the PSR curriculum. Students should be enrolled in one of these programs. Couples should contact the rectory at least 6 months prior to the desired date of the wedding. At least one person should be a registered member of the parish.